It’s a great idea to sync important data. It’s convenient and useful. But is it possible to sync data automatically while we are doing something else? For example, you added new events and contacts to your Android just before 30 minutes and they automatically synced with the iCal on your Mac while you were busy doing something else! Isn’t it wonderful? You don’t believe it? It’s actually possible with SyncMate Expert. You just have to configure it once and it will carry on the rest. 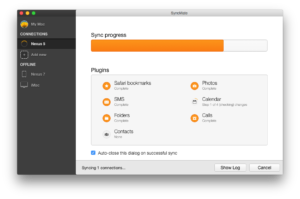 The extremely useful sync tool SyncMate is available in two forms: Free and Expert. The free version syncs contacts and calendars between your Mac and several other devices as well as accounts, whereas the Expert edition syncs photos, videos, folders containing several files, music and playlists and so on. As said earlier, it can sync automatically. You can also conveniently manage your Android text messages on your computer with SyncMate, an app to sync Mac automatically. How to Sync Data Automatically Using SyncMate? Download and install the free version of SyncMate. Upgrade to the Expert version. However, keep in mind to try syncing contacts and calendars for free prior to upgrading. Hit the “Add New” link you will find on the left and select Android. Connect your Android device to your computer. Upon getting connected, go to the “Summary” tab and select “AutoSync” option. Activate it and set it up as per your convenience. You can set up auto syncing whenever the connected device is at hand at a set time; do your work while keeping it in the background. The setting will work for all forthcoming sessions. SyncMate needs OS X 10.8.5 and is compatible with iOS 5.x-10.x devices and Android 4.x-7.x devices.